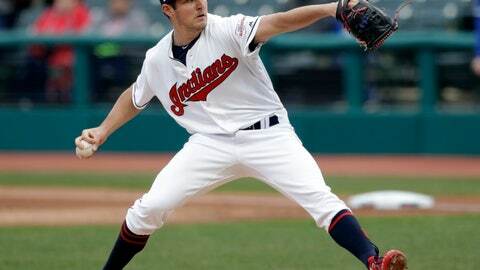 CLEVELAND (AP) — Trevor Bauer was pulled by manager Terry Francona after seven hitless innings and 117 pitches, and watched from the dugout as Toronto’s Freddy Galvis broke up Cleveland’s bid for a combined no-hitter with a leadoff single in the ninth inning of the Indians‘ 4-1 win Thursday night. ANAHEIM, Calif. (AP) — Joey Gallo hit a three-run homer and Ronald Guzman added a two-run shot in the first inning, and Texas extended its strong start. Shin-Soo Choo got credit for a three-run double in the fifth when Brian Goodwin badly misplayed his short hit to left with the bases loaded, and the Rangers ruined the Angels‘ home opener while cruising to their fifth win in seven games. Mike Trout homered and threw out a runner at home for the Angels, who have lost five straight to drop to an AL-worst 1-6. New manager Brad Ausmus’ Halos are off to the franchise’s worst start since the 1961 expansion club began 1-8.